The Big Green Day is here. 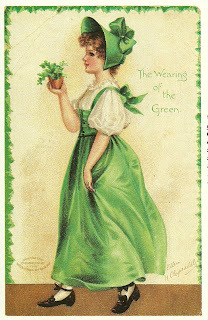 This has always been a big holiday in my family, as my Mother’s parents both came from Ireland. Our favorite treats are a bit Americanized, just like th holiday itself. My Mom’s favorite St. P’s Day food is the green Hostess Snoball. Currently I have 4 of those left in my cabinet for my boys (ok, and for me). My Grandma Curtin did love the traditional Irish Soda Bread and Corned Beef/Cabbage, but she also liked to take us all out to Bennigan’s for 2 for 1 Brandy Alexanders. (She drank those of course, not me when I was little.) She was not a huge drinker, but that was part of her celebration. I have put many posts on this blog about St. Pat’s Day and foods, and you can find those in March posts for the last 4 years on the archives too. But I wanted to get at least something up to mark the big day today too. This charming card is from my Southern Heritage Southern Living series, the Celebrations volume. This is part of a ‘St. Paddy’s Day in Savannah.’ It indicates that it has been a big holiday in Savannah since 1812. Interesting. Enjoy the Soda Bread recipe and your day in Green. Sift together all-purpose flour, baking soda, and salt in a large mixing bowl. Cut in butter with a pastry blender until mixture resembles coarse meal. Stir in whole wheat flour, mixing well. Add buttermilk, stirring until the dry ingredients are thoroughly moistened. Turn dough out onto a lightly floured surface, and knead about 5 minutes. Shape dough into a round loaf; place on a greased baking sheet. Using a sharp knife, cut a cross 1/4 inch deep on top of loaf; lightly sprinkle cross with flour. Bake at 400F for 40 minutes or until bread sounds hollow when tapped. (Ummm?) Remove from baking sheet, and cool completely on wire rack. And yes, I’m up at 4:30 a.m. blogging. Steroid Girl is feeling a bit better here if shaky and ramped up. This entry was posted in Amy's Blog, Vintage Cookbooks & Crafts and tagged cookbooks. Bookmark the permalink.